This has been brought to my attention, and for this person to Slander, Lie and Attack two people, who have had the courage to speak up against a Fraud. Well let's just say it's libelous statements as the one on the Kobi Page that will wind up getting the Bolte's into trouble. Firstly anyone who is still in contact with a Mrs. Peter's cannot be trusted, and that goes for the Bolte's. Granted you saved Kobi from the horrors he faced with DP, but you must also realize DP is not who she seems. She is not an approved rescue, she is not allowed to pull from MDAS, and if people would call the MDAS to learn for themselves, then they would realize the truth. Snap Shot- Diana Is Not Approved: Thanks for sharing this snap shot, with me. Does anyone else see what that says? NOT AN APPROVED RESCUE.. So, you admit that Diana Peters gave you permission to use a PHOTO that was never hers? It belongs to Joe and Sherri. I know why they are upset, I know all the gory details of what Happened, And I also know Diana Peters lost all her court cases against Darcy and Sherri. Joe and Sherri are not on the internet rampage, where do you see this? Where do you see them attacking you? This was brought to my attention by another person, and she is highly infuriated due to the fact that you blew up in her face. I'm glad Facebook did their job and took that Photo down. It doesn't belong to you, it had their child's body part in that picture (arm, hand). Being that it's apparent you do not have children of your own, you can't imagine how upset they were. Any parent that see's a picture on the web, without their consent of their child, any part of their child, would piss any parent off. I'm not attacking you Bolte, I just think you lack the understanding of a parent's mentality when they want to protect their "children". Yes do google Sherri and Joe, and you will see that they have been through enough slander and lies to last a life-time, which has all been posted by Diana Lynn Peters, who has been speaking about herself in the third person, Diana Lynn Peters, also has many alias's she goes by which can be found in previous articles and on the Good The Bad and The Ugly of south florida Facebook page. 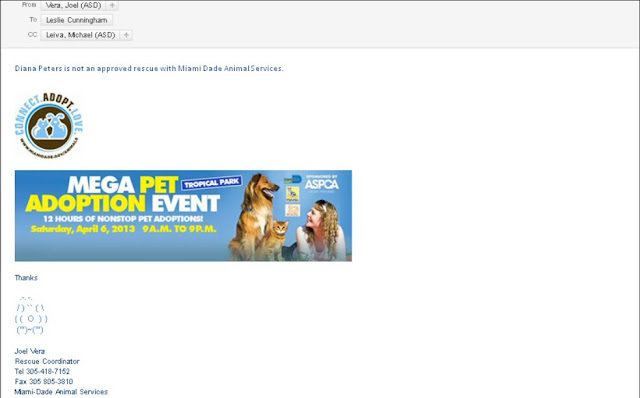 However, you will also see all the good they have done for the animals in Need. Need more information on Diana Listen to the Radio Show. "Go Away Diana"
If I were you Bolte, I would stop this defamation on Joe and Sherri before it get's too out of hand and messy. Just saying from experience Bolte, things like this should not be made public since there is always more to things then meets the eye. They can file a report and can report you for cyber bullying them. You lost more then your cool Bolte, cussing and insulting them, than removing everything that was stated on your page. Why is your page even up, honestly? It has nothing interesting, only the 3 same pictures of a dog sleeping. He's a handsome boy, but I think his owners are flapping idiots who drank too much drug induced Diana Peters Kool-aid. Kobi Page All the statements made by Bolte is not true, and a contradiction. 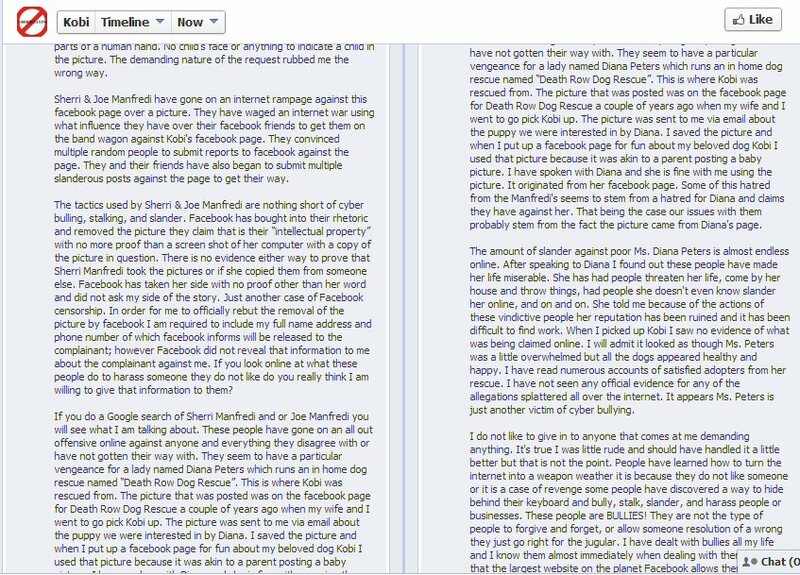 Especially the part were he states that Joe and Sherri convince their Facebook friends to stalk, lie and message people to report the Kobi Page. Hate to tell you Bolte, Joe and Sherri talked to Facebook Directly and got you on intellectual Property, since they Had more proof and rights, in wanting that picture down. Top it off it wasn't them who asked people to report that picture, It was Us. The fact is, it doesn't matter if the dog belongs to you or not, you didn't take the picture, the child, is not your child, and Joe did ask Nicely. Maybe you should ask Diana Peters why they are so upset about their Child being in any picture, that has any affiliation with the Death Row Dog Rescue business. Maybe you should ask Diana Peters why she verbally insulted their child. What sane adult insults a child? Again we are here for the defense of Legit People, Legit Rescues, Legit Advocates and Legit Activists. What you have done Bolte was act out against these people, who've had the courage to do what no one else could bring themselves to do. So Yes, We will defend Joe and Sherri. Excellent proof! Excellent documentation! Thank you, Voice for the Voiceless! Please stay tuned to a very important announcement! We will have it posted on our page by Friday evening April 12th, by 9pm. Let me provide for your readers. 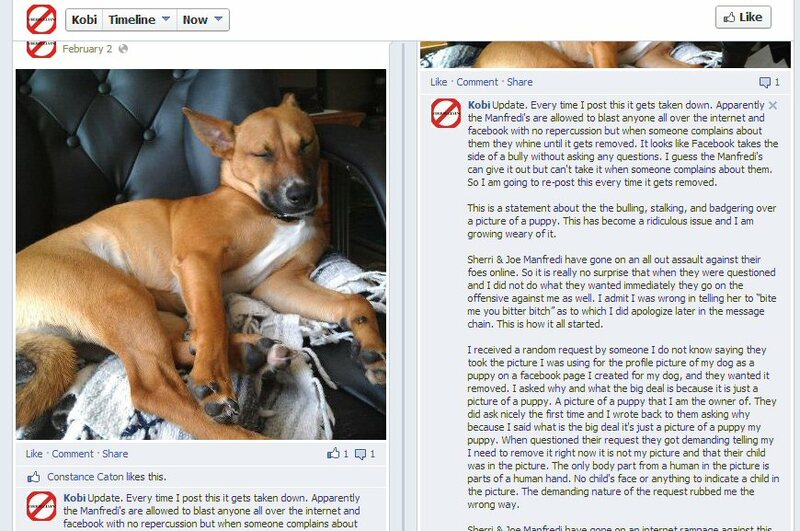 >>> Facebook page Dog rescues-the good-the bad-and the ugly of South Florida. Voices For The Breed,thank for for exposing what Richard Bolte is doing to my family. I did not even know you knew this was going on, and took your time to try and explain it to this man who has gone on a rampage. I have not messaged him, nor posted about his harassing activities since I was forced by him to take my concern to facebook, as he would not remove the picture and was nasty to me when I politely asked him. When he asked me why, I explained. It did not matter to Richard J. Bolte of Delray Beach FL. Everyday since facebook took down the photo, he has been using his Kobi Bolte page to spread libel and threaten me. Facebook has been wonderful with removing the posts. 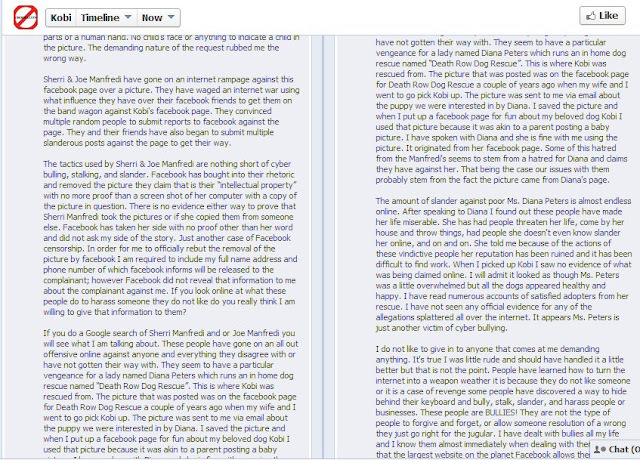 The trouble I am having is getting them to look at the same copy and paste that he put on all his photo's. FB looks at the photo not the words. This man has taken this to a level it did not need to be taken to. The only one cyber bullying is Richard Bolte. The sad fact is if Mr. Bolte had been nice, and removed Cocoa's picture, and had not resorted to calling me names (quite adult for a 41 yr old man),I could have provided him with other pictures of Kobi as a puppy that did not include my daughter in them, as well as photo's of the sibling pups and Mom Sunshine. Sunshine ironically was part of the re-rescue of dogs from Diana Peters in September 2011. Four months after the picture was taken, and pups adopted out, poor Sunshine was still not vetted and spayed, though she came to DRDR as a stray. Thank you again Voices, I am touched that you have taken your time to do this post. I came to the conclusion, that these people who received dogs from Diana do not know the real her, all they care about is they got the dogs. Granted a majority of the time it is a good thing, because it is all about dogs safety. Yet when it pertains to the Death Row Dog Rescue it is a very touchy subject, since Diana, and Sonia have both verbally insulted a Child on a radio show none the less. So, being that I have many experiences with Parents protecting their children I have put two and two together that this was the whole reason you guys were upset. Still are I imagine, since Diana Still has pictures up on her page that have your Daughter in them. Truthfully if I were asked nicely to remove a picture that had a kids face and or arm etc from my page I would, without hesitation. Then again I don't use pictures without permission from the original owner. For Bolte to react in such a way is appalling. And if Facebook won't do anything about it, there are others who will listen and will clear your names from this slander.